We are in August now, so I guess it’s good to take a little step back and see what drawings I made in the previous month stand out to me and why. An artist I follow on Livestream is Hitomi. 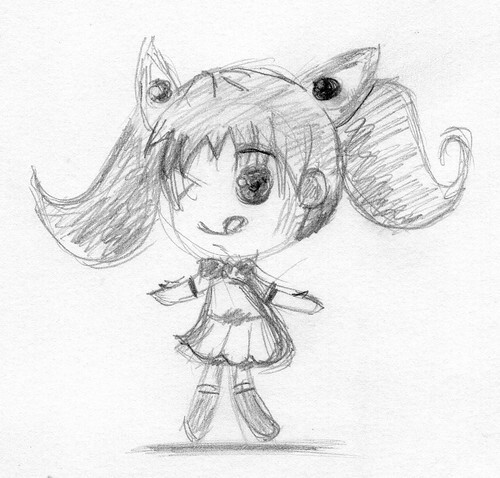 While she drew in Easy Paint Tool SAI, I drew along in pencil on paper. This is so different from what I normally draw, that I think it stands out only for that. Inspired by watching My Little Pony: Friendship Is Magic on YouTube, and how my brain works, I drew this My Little Chicken. I did quite some digital clean up, while retained as much of the sketchy character of the original as I could. For me it popped out between the images, so that’s why I picked it. This was a combination of two things, the clothed figure sketches I was doing for quite some time now and the Preston Blair exercises I’m doing since July, after a long hiatus. It stood out to me, because it’s so imaginative. This cry of hopelessness was one from the heart. I would like to do so much more, but something is holding me back. I know what it is and that I can’t do anything about it: personal limitations. Here’s a digital drawing that totally stood out for me. Although there are several things wrong with it, the fun of the subject jumps out at you. These are festive mice! 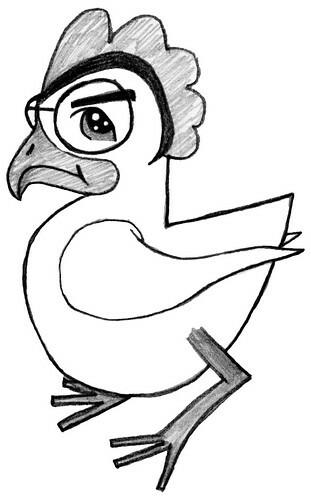 This was my contribution to Tuesday Sketch 2. The subject was Bruce Lee. Others seemed to like it, so that’s good enough for me. 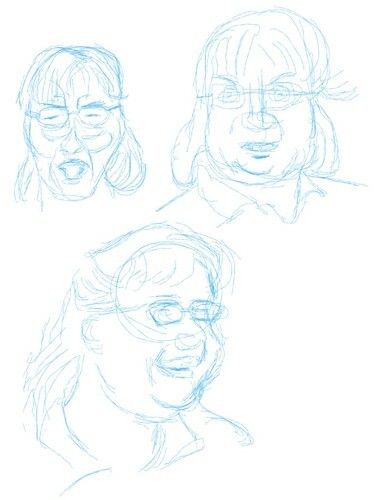 This stood out to me, because it was drawn on an iPad with the app Procreate. 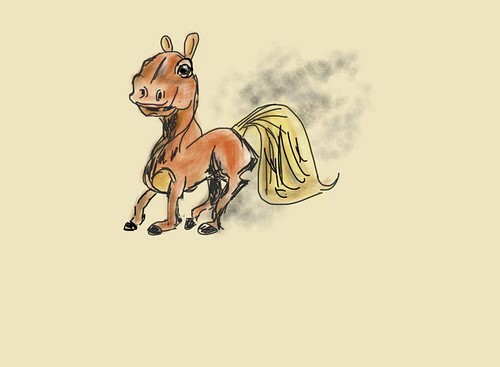 It encapsulates what I was busy with at that time (drawing horses, inspired by MLP). This one, titled Cat Doing Duck Things, stood out to me, because it started a new mini-project for me, trying to redraw a pose drawn by Carl Barks, of Donald Duck comics fame. His poses are clear as water. If I only could approach 10 % of his level of craftsmanship, I’d have a career in cartooning. 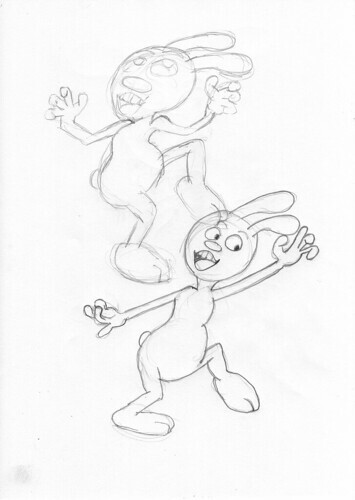 I have been trying to draw from the book written by Preston Blair about animation for several years now and giving up because it was just too hard. However, with all this life portrait drawing, clothed figure sketches and the like under my belt, it seemed more feasible to try and do the examples in the book and create some examples of my own. I used a sphere for the head and a basic skeleton for a cartoon mouse. 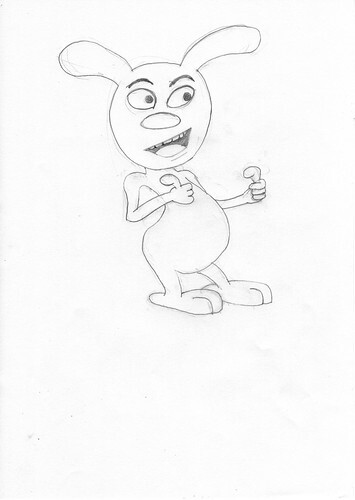 After I had the basic poses done, I added the features and then the details (I really need to work on hands and feet). The result was better than I expected and made me believe I was on to something. Next day, after having spent some time on Livestream with young artists drawing their Manga art, using Easy Paint Tool SAI, I thought I could do a digital drawing in the Mac equivalent of SAI (which is Windows-only), Sketchbook Pro. I even did some live recording on Livestream (here, here and here—no audio). Looking back at it, I can see it has potential, but also that I still have a lot to learn, both in how to use Sketchbook Pro (which hung up on me during the recording) and, more importantly, how to design a character. However, I didn’t want to get hung up by details. The intent, what I wanted to show, was more important than the exact details and even the execution. 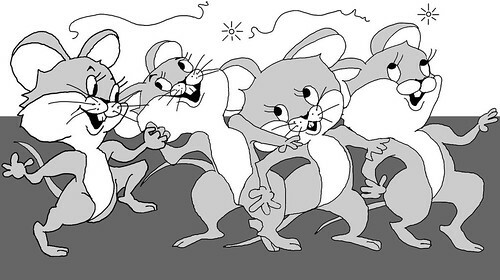 And boy, did it show these are jolly mice! 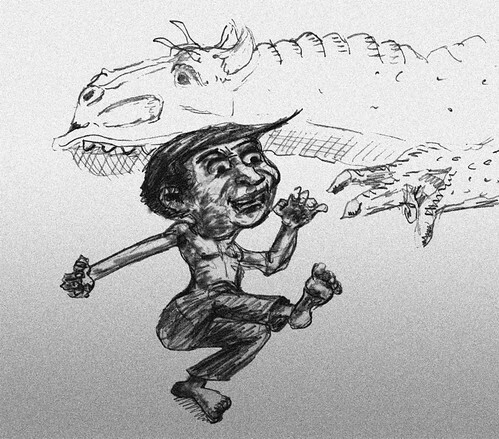 I’ll be practicing my cartoon sketches for a while so I can finally do an adaptation of a fairytale in comics format. The style and design should be early 20th century Disney, because I think that style best fits the telling of fairytales. I’m sure once I’ve started I’ll be writing about it on this blog. Thanks for reading and feel free to leave your thoughts, ideas and any praises in the comments section. To keep pushing my drawing skill, I did another figure sketch with a camera recording it. As always, I’m easily distracted and things didn’t turn out as expected. Nevertheless, I soldiered through and even did a somewhat decent voice over. 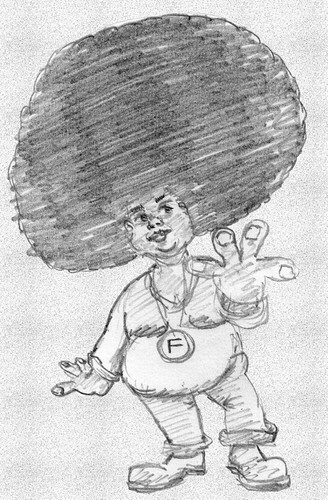 Here is the scanned sketch. I’m wondering if I should do two or more versions of a sketch, because I can see so many things wrong with this one. It might be the recording equipment (rather the fact that it’s being recorded, which makes me nervous), or just the lack of a proper workflow during the sketch. So many things to think about while drawing. And yes, I see that both feet should have been drawn touching a floor. I wonder why I can’t think of such things while I’m drawing. Maybe 17 minutes is still too fast and I need to take breaks between the separate steps. Ah well, progress is slow. I’ll get there, eventually. I’m trying to increase the amount of time I’m drawing. A few years ago, I was having problems drawing every day, but now that is what I’m doing. However, what I’m currently have to deal with is that once I get above an hour of serious drawing (drawing with intent), I get all stressed out and have a hard time sleeping at night. While the mantra used to be “draw every day”, it now has become “draw most of your free time.” I suppose this will mean removing obstacles, both physically (sketchbook) and mentally (variation). If you draw more or less the same stuff all day, you can get bored and stressed out. Variety is the spice of life. 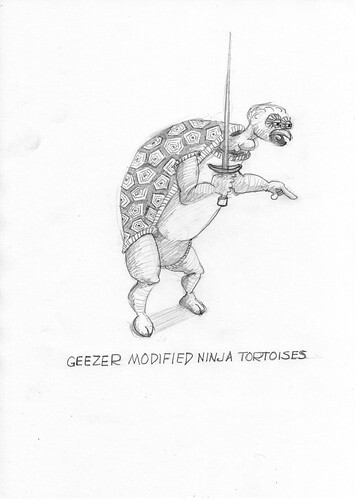 ⇧ I tried this variety thing out yesterday, by doing a spoof on the Teenage Mutant Ninja Turtles. Having a laugh trying to ridicule an established intellectual property is what can motivate you to be creative (mix and match). ⇧ One of my favorite web comics at the moment is Chippy & Loopus by John Sanford. He has a streaming show on Livestream now, where he shares his ideas about comics and anything else people in the chat are interested in. Anyway, his main character is a bunny with a potty mouth and incredible strength. 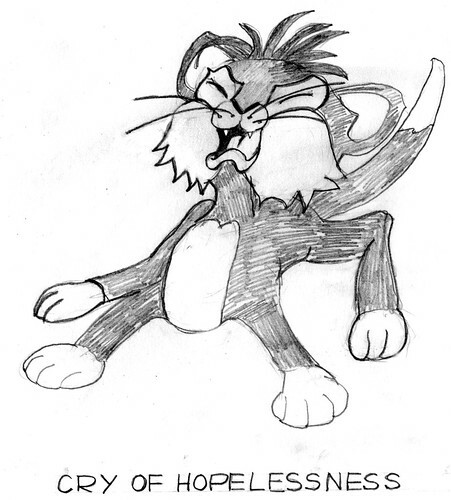 His drawing style is very much influenced by animation, and especially Preston Blair. ⇧ Anyway, he inspired me to draw cartoon characters with simple designs, which I always loved (Asterix, Walter Melon, etc.) and since a bunny is fun to play with (and excellent to experiment with), why not draw that? Here I was trying to experiment with balance and energy in the pose. The experiment failed, which meant I learned something. 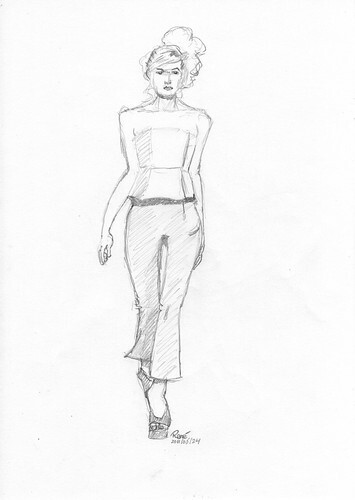 ⇧ Applying what I had learned (and probably will need to learn over and over again, because I’m a slow learner) to fashion drawing proved to be a success. This sketch is much better than what I’ve been doing so far. While having the proportions right is important, having the right feel and energy in your drawing is much more important, even if the proportions are a bit off. I think the simplified cartoon sketch can teach you a lot about more complicated sketching from life. You have more leeway and can experiment more without having it be “off-model.” On the other hand, the discipline of the life drawing will teach you to look carefully and trying to visually understand what you are looking at, to take in the whole figure as one mental image, instead of seeing parts. Seeing parts is what we are used to do. This is important for both identifying and classifying people (who is it and what state is he or she in?). However, if you want to draw someone, you need to go beyond that initial assessment and quickly construct an image of the whole person and what he or she is doing right now. A few of those impression will lead to a general impression of the characteristics of that person, the energy, presence, dynamics, body shape and such things. I think it’s an eternal learning process, which translates into work you do from imagination. If you want to or not, you will apply your impressions from the real world into your comics drawings. And the reverse seems to be true as well. What you learn from comics drawing you can apply to life drawing. It is said you should push your design, but few say how to do it. 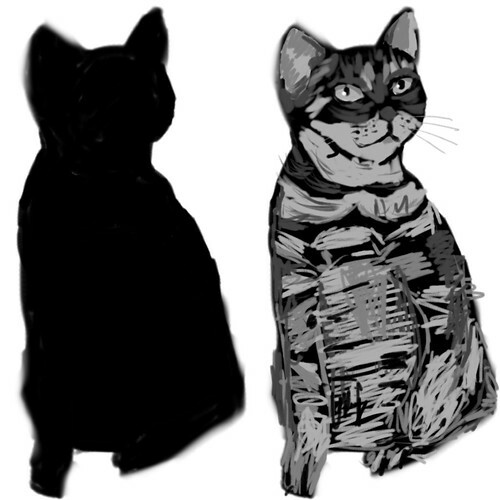 I’m curious, so I tried the method of overlaying a sheet of paper on a design to use for a next design. I’m not sure if it’s the best method, but it is a method that seems to work. 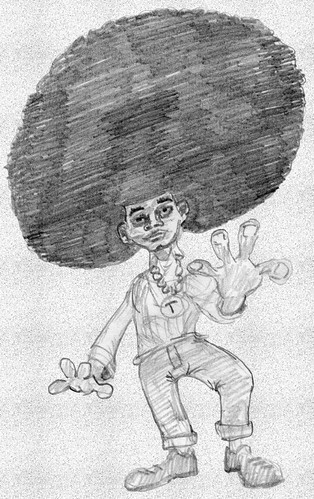 ⇧ This guy with an afro popped out of my head, but was it as extreme as I thought it was? ⇧ I put a piece of paper on top of the previous drawing and made it more extreme. Surely, this is as far as I could go, isn’t it? 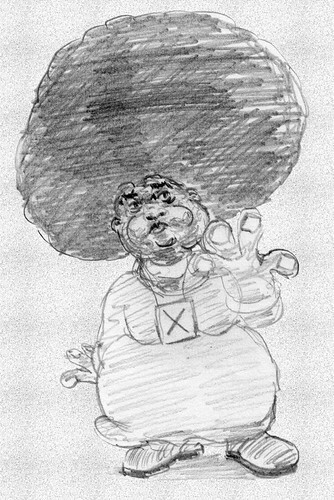 ⇧ While I had already fattened the original guy with an afro up, but I could go more extreme yet. This guy is overflowing with fat tissue.